If you're headed out this fall to visit college campuses, make sure you check out our Gourmet Guide. We've got recommendations for where to dine -- fine restaurants to food trucks. We've asked admission staff, alumni and current students for their best bets for breakfast, lunch and dinner. From pancakes in Nashville and pies in Pasadena to Belgian bistros in Bryn Mawr and ice cream in Ithaca -- we've got you covered. Organized state-by-state and by campus, the guide will help you find the perfect cup of coffee, vegan sandwich or best bagel so you can relax and recharge before the next stop at the next campus. Also, don't forget to check back in with the Guide -- soon to come are recommendations for Duke University in North Carolina, Creighton University in Nebraska, University of Virginia, and Purchase College in New York. Jenny Rickard, Chief Enrollment and Communications Officer at Bryn Mawr College, joins us this month to answer five questions about the private women's liberal arts college founded in 1885 "for the advanced education of females." Located in Bryn Mawr, Pennsylvania, just ten miles west of Philadelphia, the 135-acre campus hosts approximately 1300 undergraduate women. With an 8-to-1 student faculty ratio, Bryn Mawr offers 36 majors, 38 minors, 8 concentrations, and the opportunity for students to develop independent courses of study. But Bryn Mawr students can choose from among more than 5,000 course offerings because of the cooperative relationship the school has with neighboring Haverford College and its ties to Swarthmore College and University of Pennsylvania. 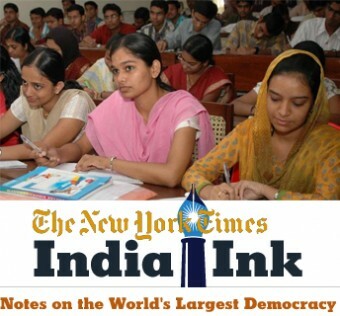 Our primer on standardized testing for international students applying from India is up on the New York Times' blog India Ink. Thank you to Jacques Steinberg, education writer and author of The Gatekeepers: Inside the Admissions Process of a Premier College, who helms the New York Times' blog The Choice, for inviting us to explain the role testing plays in the admission decisions of American colleges and universities.